Birmingham scientists have discovered an ancient cousin of the Tyrannosaurus rex - and it was a vegetarian. Birmingham scientists have discovered an ancient cousin of the Tyrannosaurus rex – and it was a vegetarian. A team from the University of Birmingham took part in a study to analyse some ancient bones which were discovered in rocks in Chile. 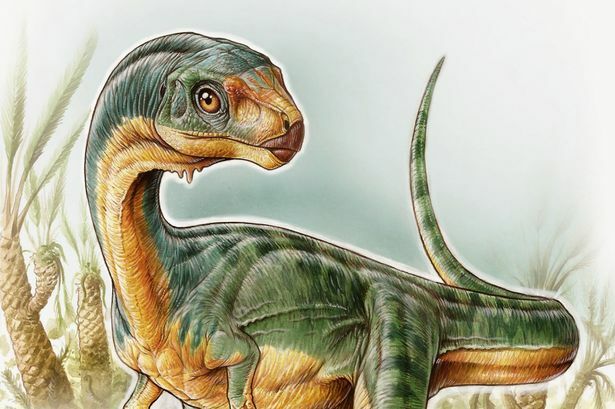 Martin Ezcurra, who is studying for his PhD, said the Chilesaurus diegosuarezi, belonged to the family of two-legged theropods which included famous meat-eaters such as Jurassic Park star Velociraptor, Carnotaurus and T. rex. Mr Ezcurra said: “I was part of the international team that identified this strange creature by analysing bones enclosed in ancient rocks. Our research revealed that the Chilesauraus was relatively small, a fully grown adult would have measured about 3.2 metres. He explained that the creature had leaf-shaped teeth, meaning it was most likely a plant eater. Other signs were robust legs, which resemble those of other herbivorous dinosaur groups, and the morphology of the pelvis that allowed it to increase the gut capacity for processing plant material. But deciding how Chilesaurus looked was quite a problem. Mr Ezcurra said: “Identifying what the dinosaur looked like was not the most challenging of the research, but it was very difficult to figure out which dinosaur group it belonged to – an issue we spent many late nights discussing. “We were completely astonished by the fact that each part of the skeleton that was cleaned out from the surrounding rock resembled a different group of dinosaurs. “However, there is no possibility that Chilesaurus is simply made up of different dinosaur bones, because we found four partial skeletons. Until now, the only non-carnivorous theropods known were late arrivals during the reign of the dinosaurs and closely related to birds. But Chilesaurus was munching on plants at the end of the Jurassic period 145 million years ago, around 80 million years before the appearance of T. rex. Mr Ezcurra added: “A bizarre combination of features like that seen in Chilesaurus can also be seen in living animal species, such as the platypus, which is a mix of duck, beaver and otter. “Some naturalists even considered it a hoax. But animals such as Chilesaurus and the platypus can be explained by an evolutionary process called convergence evolution, in which two unrelated species or groups acquire similar characteristics because of living in similar environments or having a similar behaviour.